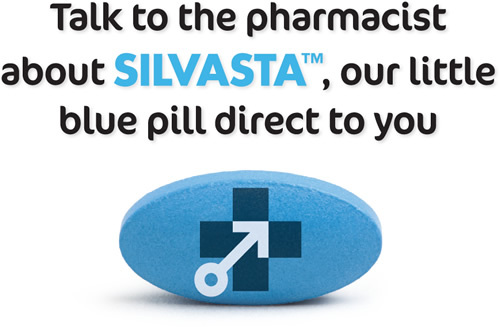 SILVASTA™ contains sildenafil, the same active ingredient as in other leading ED medicine brands such as Avigra® and Viagra®. Our pharmacist will run through a checklist to ensure SILVASTA™ is right for you. This will only take a few minutes and includes a heart and blood pressure check. Some men should not take ED medicine, e.g. men on certain medicines, or men who have had a recent heart attack or stroke, so your pharmacist will need to ask you some general health questions to ensure that SILVASTA is appropriate for you. Repeat supplies will only take a few minutes to supply, provided your health hasn’t changed since.